We made this giant marquee sign last summer and I loved making it so when I saw these Mini Globe Lights I knew had to make a mini version. I actually made this project last month but forgot to take photos. So when I pulled them out of the bag the letters were a little bent after being ignored. They are made out of paper so if they are on a shelf they’ll be fine but from experience I just don’t recommend cramming them in a paper bag. This would be cute for a birthday party or even a Christmas party. Depending on how many letters have it takes 1-2 hours. The key to making this project go smoothly is getting the right glue . See instructions and photos below. Click through for full instructions and photos! (p.s. : The letters don’t light up separately, it’s just a photoshop trick. Step 1: Download and Print the free template onto cardstock. Cut out the letters you need. Step 3: Figure out how many holes you need and make sure you have enough lights. You’ll want to leave a light in between each letter for space. Punch a hole. You don’t want these too small or too big. A standard hole punch is slightly too small so after you make the first punch, repeat on edges to make the hole a bit larger. It is ok if the holes aren’t perfectly round, you won’t be able to see them. Step 4: Take the strips of paper and score where it will need to be bent (around the corners.) Once your folds are in place add the fast drying tacky glue about 3/4 of the way up the strip. Wrap the strip around the letter and hold for 30 seconds until it sticks. Reinforce with a few small pieces of tape. Step 5: Once the letters are dry paint them. We just used spray paint, let it dry. Step 6: Put the lights into the letters and plug in! I love this! Those colors are very beautiful as well! Oh my cuteness! Love, love. Cannot WAIT to try this one. So cute!! I can’t wait to try it! 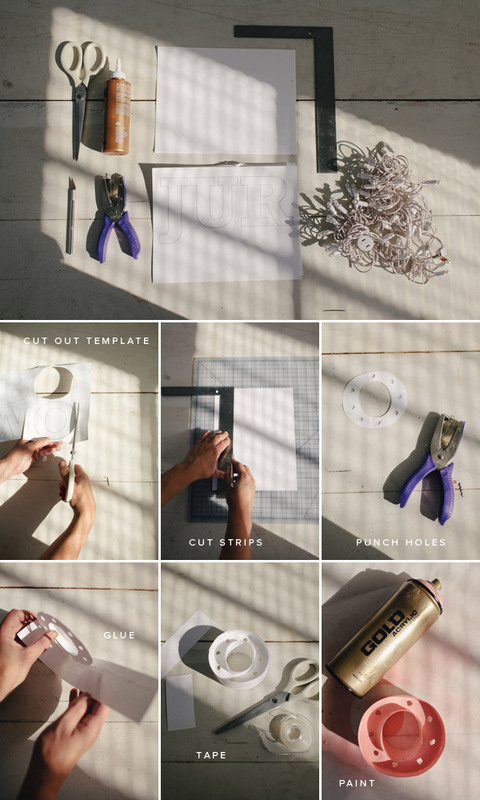 This would be so good for so many things.. Great DIY project! Those are so cute! I totally want to make some for my kids rooms. It’s made of little paper balls I got in France. this is amazing. i might almost want to attempt this. i love this so much jordan! So pretty! I’m going to practice until I get it right! Thnx for posting! oh! these are the cutest! super cute! I want to try this! These are crazy cute!!!! What a fun idea! Thanks for sharing! I love this! I’m not sure if I could get those fantastic globe lights, but I imagine Christmas lights would do the trick eh? This is SO AMAZING! What a great DIY post! This is so cute! Even your palette is perfect! ABSOLUTELY love this. Saw it on your instagram. it’s really so cute. Thank you for this tutorial. I vill try to do it with the first name of my son.I look at your blog but never dared to post a comment. I’m starting today to say thank you. And hello to Toulouse in France! What a fabulous idea! I always wanted to make the larger ones but never had enough room to spell out what I wanted so this will be perfect! Are you kidding me?! This is FANTASTIC! seriously the best diy I have seen in ages. really hope I can pull this off. So so SOOOOO cool! I need to find some time to make this. I love it too! The sign and the gif (!) are amazing. Wow, love these!Am going to try these at Christmas ! GREAT Project! It looks like the lights are sold out on Amazon. Do you know of anywhere else I could buy them or something similar? Thanks for sharing another brilliant idea! 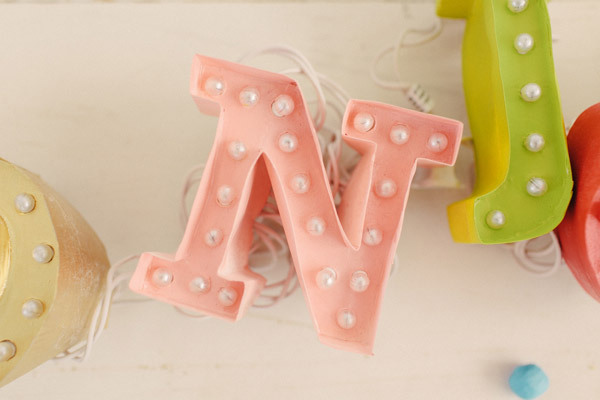 can you make a template of all the letters for your larger marquee letters? or tell me how to do it? I absolutely love both sizes!! This is the cutest diy i’ve seen in forever!! I can’t wait to put these all over my house!! You have the best ideas! This has to be one of my favorite DIY projects. So cute! Can you post instructions on how to do the larger marquee letters. I am helping a friend create the letters as a proposal to his girlfriend that will be included in a Christmas light display. I read that you use the Rockwell font but we can’t get it to print out on multiple pieces of paper. Please help! We have already started making the letters for the letters that we need out of your “Movie” wording but need the additional letters as well. This is the cutest thing I’ve seen in a long while! So creative and looks so professional! I am going to try this for my daughters birthday. I came upon some flashing mini lights (battery operated) and I think it will give it a nice touch. Using as a centerpiece at her Carnival Themed bday party. I’ll let you know how it turns out. Target has similar lights for Christmas for $10 a strand. They sell out quickly though! 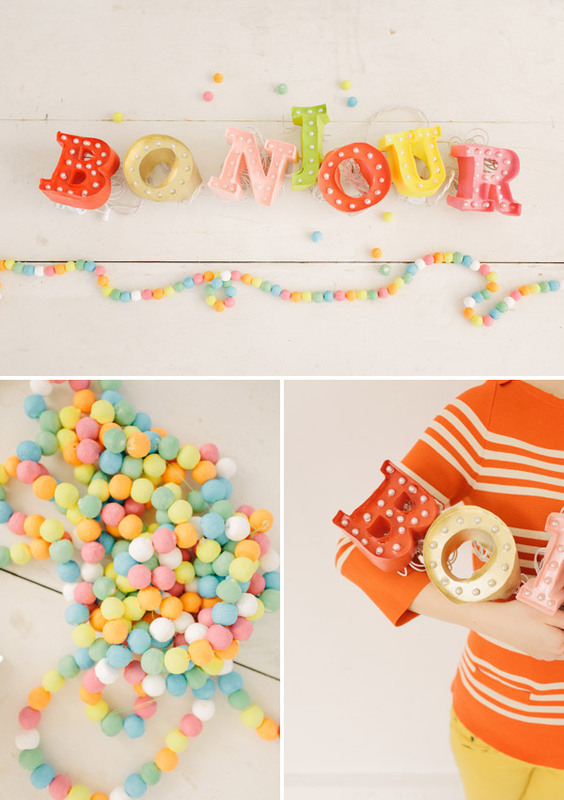 I love the pearl lights & this DIY is genius! Love love love it! Can’t wait to try it. this project is ADORABLE. you are too creative! this is one i’d love to try. I love this at first sight! These are brilliant! I’m so in love. really loved it and was inspired to make one for my daughter’s 21st. Didn’t have the glue which made it hard to put together, but am quite happy with the results. Thank you for your great ideas. I love this and want to make one for myself. Can you tell me how many strings of lights you used for this project? It looks like more than 1. Also are these lights smaller than the typical small globe lights sold at Christmas time? Is the templete just for ‘Bonjour’? . I want to do this but need different letters.